Can You Put a Hot Tub in Your Basement? Posted on January 19, 2018 January 15, 2018 , in Hot Tubs. If you have decided to purchase an indoor hot tub, you may be wondering if you can put a hot tub in your basement. For the most part, basements can be an ideal location as the concrete flooring can properly support the hot tub. However, before you install your hot tub, there are several factors which need to be considered so that no damage is caused to your home. Below, we will outline what you need to know in order to install a hot tub in your basement. If water splashes onto the floor surrounding a hot tub, it can become a safety hazard for slips and falls. When planning your installation, make sure that your hot tub will be surrounded by non-slip rubber flooring mats for bather’s safety. It is also important to have proper drainage as well as moisture resistant flooring. If water is left sitting on the floor it can eventually cause structural damage. The evaporating water and high heat produced by a hot tub will increase the humidity in the air. When moist, humid air mixes with cooler air in the room, it creates water condensation. If water condensation is not removed and builds upon heating ducts, windows, fixtures, and outlets it facilitates the perfect environment for mold growth and can cause further damage such as rotting. As your hot tub will produce increased humidity, in order to avoid condensation you will have to have proper ventilation in your basement. In cooler months, a furnace can help in drying out the humid air and in the summer a central air system will help dehumidify, however, these are not enough to handle the condensation. It is essential to install an exhaust fan designed to vent the humid air outside of the room to remove the condensation. Mechanical ventilation systems are recommended as they continuously vent fresh air from outside into the room while exhibiting the humid air indoors. It is important to hire a professional architect or contractor that is experienced with hot tub installations if you have decided to place your hot tub in your basement. This will not only ensure that the best location is identified and that you have the proper ventilation, but they may recommend other materials such as moisture resistant insulation that will help protect your home. Having a hot tub in your home is a wonderful investment for you and your family. From the benefits of improved wellness, health and quality social times with loved ones, your hot tub will be enjoyed for years to come. By planning ahead of time for your installation you can rest assured that your basement will be the perfect place to enjoy your new hot tub. 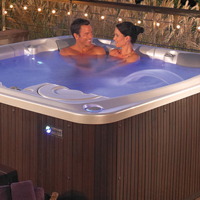 To learn more about hot tubs and installation, click here to download a hot tub buyer’s guide.